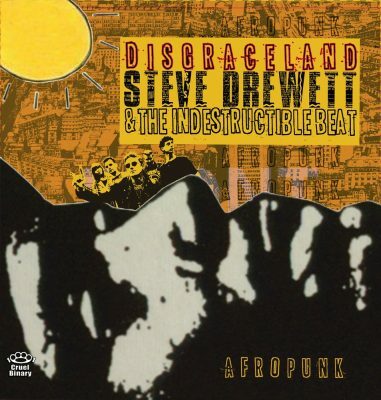 Steve Drewett & The Indestructible Beat were founded in the early ’90s. They came out of a void left by The Newtown Neurotics, who had then temporally split in 1988. Drewett took influence from the compilation album The Indestructible Beat of Soweto—released through The Earthworks Label in 1985—and started the new supergroup. This new band took its cues from African rhythms and the punk spirit,and recorded Disgraceland between 1990 and 1993 at The Square Studio. It was engineered by Nick Robbins, Richard Holgarth and Chris Fallon during different takes. Disgraceland was originally released in 1993 on cassette and has since been an obscurity, until now. Disgraceland is a concoction of high-energy numbers that could make one think of The Pogues’ Irish jive, but with the distant, worldly feel found in Joe Strummer and The Mescaleros. Drewett’s musical roots are obviously grounded within the desperation of first-wave punk rock. In Disgraceland, he takes that energy and evolves it into something danceable and sophisticated. Much of punk relies on simplicity to deliver a message. With Drewett’s album, you get that same message, in a dramatically mature work. Like other music that Drewett produces, Disgraceland is uniquely intelligent and catchy. This prominently comes from Drewett’s brilliant lyricism, which is unapologetically opinionated and straight to the point. Of course, this is best heard with a Newtown Neurotic classic, “When The Oil Runs Out”—a cover that finds itself inserted in Disgraceland. This alternate version still captures Drewett’s angst, but with a chaotic feel. Another interesting find is the cover of “Capital Radio.” The difference between the original and cover is striking. The former is angst driven, while the cover is backed by African percussion, giving it a smoother sound. Other tracks on Disgraceland also demonstrate Drewett’s ingenious ability to weave together a political pop tune that sticks to the memory like glue. “Something Kinda Critical” is infectiously soulful. “Take My Advice” has a fatherly jazz kind of tone. “Disgraceland” is a rocking beat that reminds me all too much of Strummer’s protest-driven, lyrical quality. “Scum Class Tourist” is another one that possesses a culturally critical overtone, while “Think About You” has a catchy-as-hell chorus. Overall, this is the stuff to move to, thanks to fast rhythms, constant hooks and strong beats. With Disgraceland, there is something that stands out. Fans of what Strummer and T.V. Smith did after The Clash and The Adverts will truly appreciate Disgraceland. By all intents and purposes, this is still punk rock. However, rather than relying on three-chords to tell a story, Steve Drewett & The Indestructible Beat take sound that come from a larger world and turn them into African-inspired rhythms.